The warmer weather is here, and citizens everywhere are gearing up for the summer ahead. Whether you’re planning an epic kayaking trip or traveling across the country, your season of action is likely kicked off on Memorial Day weekend. This three-day vacation is the perfect opportunity for many people to enjoy time off, allowing for a wide range of fun activities. As your trusted local brew pub in Minneapolis, The Herkimer is here to be a guide for those new in town or those procrastinating their plans. For years, our brewery bar has worked to combine the most delicious foods with our small batch craft beers in a fun atmosphere. 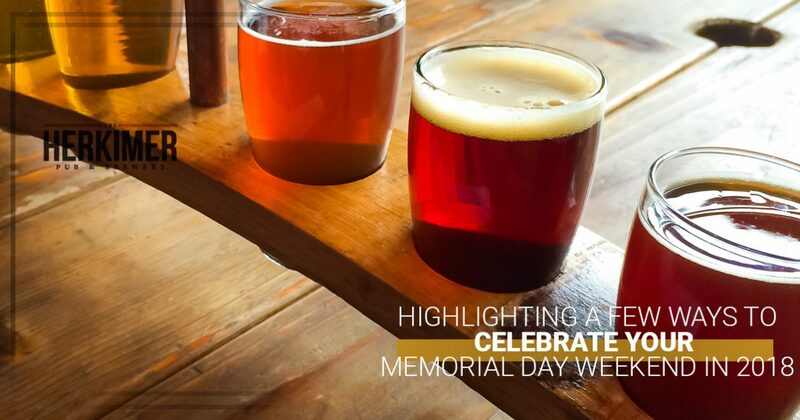 We’re not telling you how to live your life, but we can offer a few suggestions for Memorial Day. Be sure to consider a few of these, and if planning makes you thirsty, be sure to stop by our craft brewery! This fun-filled weekend would not be possible if not for the men and women that have served this great country. Memorial Day is all about the service of our veterans, remembering those lost and thanking those who put their lives on the line. As such, it’s important to give thanks. You can find a nearby parade to attend. If large crowds aren’t for you, you can also find several organizations such as the Minnesota Historical Society that provides a wide range of services and information concerning this federal holiday. Everyone loves a good barbeque! Now may be the perfect time to dust off your grill and invite the friends and family over to kick off the summer season. You can also reserve a spot at a local park to host the fun with all of the needed facilities. Almost nothing beats the fun of catching up with everyone while eating delicious food! Remember, though, that everyone else in the state will be looking to do the same thing, making it a challenge to find an open spot, let alone the hamburgers to fuel everyone. Minneapolis is in close vicinity to two state parks as well as a variety of other outdoor locales that can help you to kick off the summer right. Most humans love reconnecting with nature, taking in the fresh air while taking the time to relax and focus on the little things in life. The Herkimer is all about the outdoor life, but we also know that this common affinity for nature will result in crowds of people looking to set up their spots. Unless you’ve reserved a campsite in advance, you may be hard-pressed to find the privacy valued so much in the wilderness. Our suggestion? Camp the week after! A three-day weekend is the perfect opportunity to visit a local craft beer pub to get the most fun and flavor possible. We love celebrating this great country, and our establishment will be here to provide the most delicious wares to fuel you up for a great time. The Herkimer is proud to be your local brew pub in Minneapolis, delivering unique brews in an exciting environment. If you need plans for Memorial Day, be sure to stop by our sports bar and grill on Lyndale Avenue South to see how we do things. Even if you have big plans, our establishment serve as your staging point. Contact us today to learn about our food and beverages, and be sure to reserve your table!